The QTaskDelegate class provides drawing of QTaskModel items (QTasks). By using QTaskDelegate, applications using QTasks can achieve a consistent look and feel. 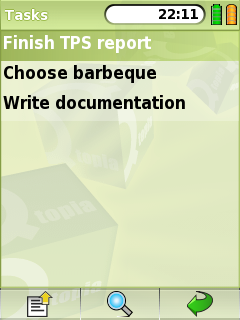 The tasks are presented by rendering their description() in bold text. Generally, this class will be used with a QTaskListView or other similar list view. See also QTask, QTaskListView, QTaskModel, and Pim Library. Constructs a QTaskDelegate with parent parent.